Although SSD prices have fallen rapidly over the last few years, they haven't fallen rapidly enough some might say. According DigiTimes' all-seeing, ever-elusive "industry sources in Taiwan," many large players concur with that sentiment -- albeit for reasons none too charitable. The market is currently flooded with drives from manufacturers both big and small. Leading SSD makers such as Kingston, OCZ, Intel and Crucial are competing with littler firms for your cash and, apparently, they don't like that. According to insiders, the big fish have hatched a plan to fry their minnow-sized rivals. In a cutthroat game of limbo, the large manufacturers want to see how low the small ones can go. Or as DigiTimes puts it, "major SSD firms have initiated price reductions to reflect falling prices for NAND flash chips. The move is also aimed at triggering a price war in the market in an attempt to squeeze out smaller peers." The sources didn't mention what companies are at risk of being eliminated, but noted that many of them are channel retailers which usually sell commodity memory products such as flash drives and memory cards. A cursory glance at internal SSD vendors listed on Newegg reveals many outfits which at least partially fit that description, including SanDisk, Verbatim, Patriot, PNY, Pretec, Wintec and Zalman. Besides obvious competitive incentives for smothering their adversaries, the larger manufacturers are supposedly concerned about smaller ones introducing inferior products that "disrupt the development of the market." DigiTimes didn't elaborate on this point. 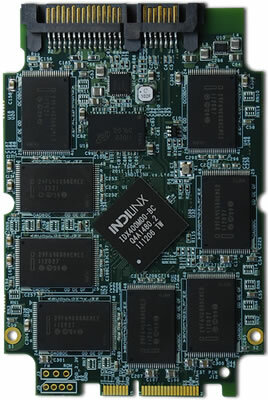 The bigger players also hope to accelerate the transition from SATA 3Gb/s to SATA 6Gb/s by shrinking the price gap between the two segments.